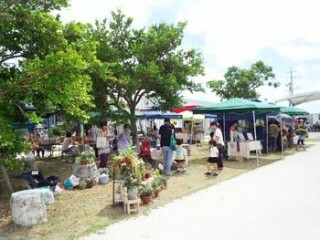 Itoman Yurari Market sells handicrafts and gardening items. Fresh from a visit by the Emperor and Empress of Japan, Itoman City is reaching out this week to promote its handmade products at the Yurari Market event at Itoman Road Station. There are a couple of purposes for the three-day event starting tomorrow, including promoting Itoman Road Station and giving Itoman City a larger Okinawa image. There will be stores carrying handmade products, gardening products, craft products, and workshops. The Yurari Market is operating 11 a.m. ~ 6 p.m. Friday, Saturday and Sunday at the Itoman Product Center at Itoman Road Station. Admission is free. Usually, Road Station Itoman is a place to purchase local products . It represents Itoman City localism. Visitors can eat a variety of foods, which are made from special products of Itoman district. The produce for sale at the market include fruits, sweets, international foods, curry, breads, noodle, and more. Souvenirs are also available at reasonable prices. To get to Itoman Road Station, take Okinawa Expressway towards Naha airport. As the freeway changes to a normal street, turn left on a bridge at the traffic light just after Tomigusuku Police Station, a blue large building on the right. When the elevated portion of the road ends, turn right.. The Itoman Road Station is immediately on your right.